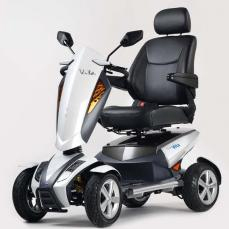 In law, mobility scooters are divided into ‘class 2’ and ‘class 3’ vehicles based on where they’re intended to be used. There are some key differences between the two classes. Class 2 scooters can only be used on footpaths, pavements, and to cross roads. They have a maximum speed of 4mph (6.4kph). Class 3 scooters can be used on roads and pavements. The maximum speed limit of these vehicles is 4mph on the pavement and 8mph (12.8kph) on the road. You must be 14 years old or over to drive a class 3 vehicle. 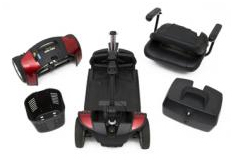 Mobility scooters vary in length, width and height. It’s important to think about how big you need it to be to sit on comfortably – will you have space to stretch out your legs? You should also consider where you will store your scooter and where you will use it. The scooter’s ‘turning radius’ is related to its size. The turning radius determines the amount of space the scooter needs to turn around completely. 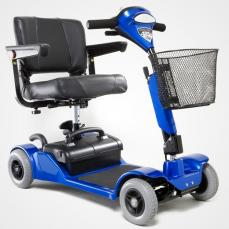 A small scooter with a small turning radius will be easier to use indoors. Scooters with three wheels have a smaller footprint and are easier to manoeuvre, but they may be less stable. There are often size and turning radius restrictions when travelling on public transport. Some scooters dismantle or fold up so they can be stored or transported more easily.